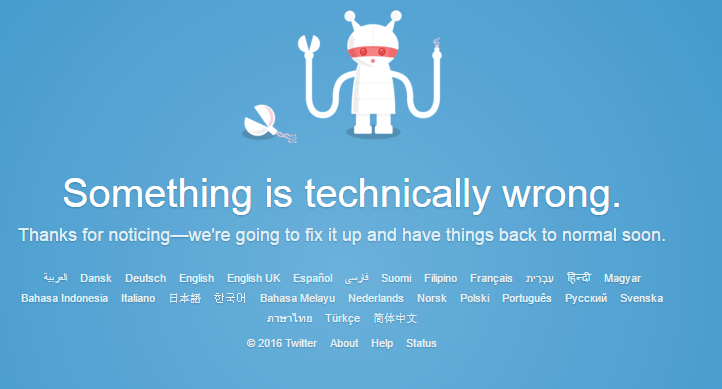 Home Technology Twitter Down Worldwide: Is “Lizard Squad” the Reason? Twitter Down Worldwide: Is “Lizard Squad” the Reason? Twitter Down: Majority of the users in the US, India, Japan, and Australia are facing problem while connecting to the platform via apps or web browsers. Meanwhile, third party services like Tweetdeck are working, but with limited functionality. As of now, the site is still showing the same error page. And the mobile page just hangs. Twitter’s CEO Jack Dorsey is currently in Australia. The following message is displayed on the Twitter page. Twitter is having issues since 10:48 PM EDT. Are you also affected? Leave a message in the comments. downrightnow.com shows the following graph. Is it working at your end? Are you also facing the problem? # The issue was resolved at 8:50 am IST. # Again not working after a minute. # A reddit user posted the following image. It suspects “Lizard Squad” for the problem. Leave a message in the comments if you are affected too. Stay tuned for latest news and updates regarding. Let’s see how much time or at what time it will be okay. twitter is down, where do i complain twitter is down?